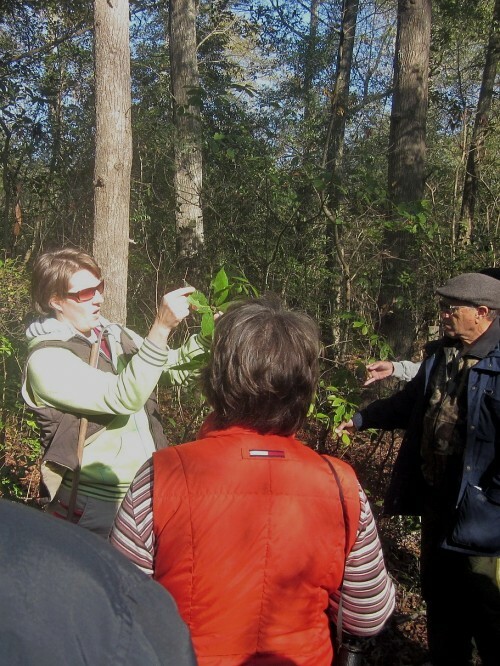 Charlotte began by discussing characteristics useful in winter tree identification: evergreen vrs deciduous, bark color and pattern, branching patterns, opposite or alternate bud arrangement, leaf shape, and twig and bud characteristics. 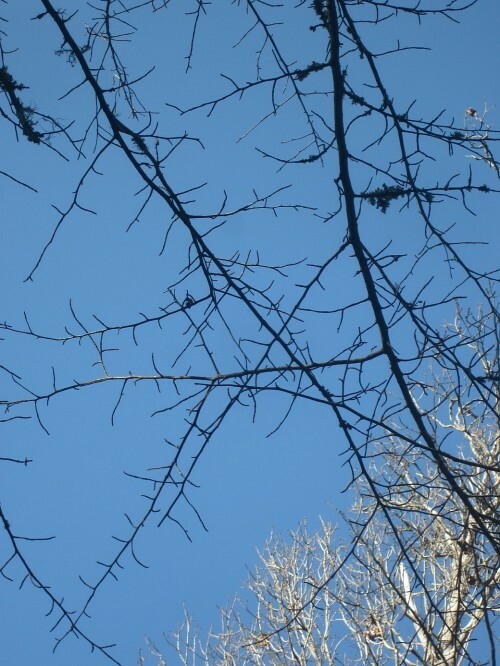 The opposite branching pattern of the dogwood shows clearly against the sky. 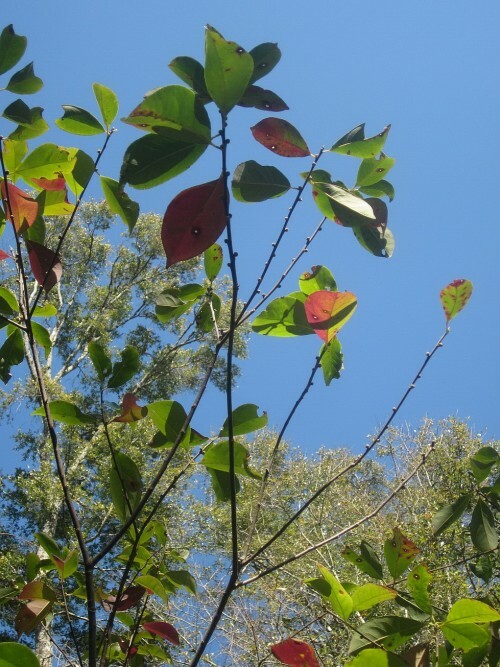 Only a few common tree families (Dogwood, Ash and Maple) are opposite in bud arrangement. 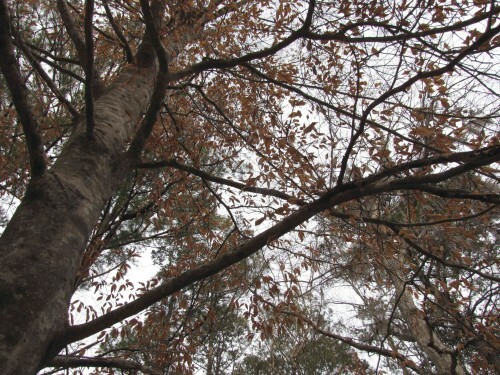 Beeches, like many coastal trees, including some oaks, hold onto their brown leaves through winter. 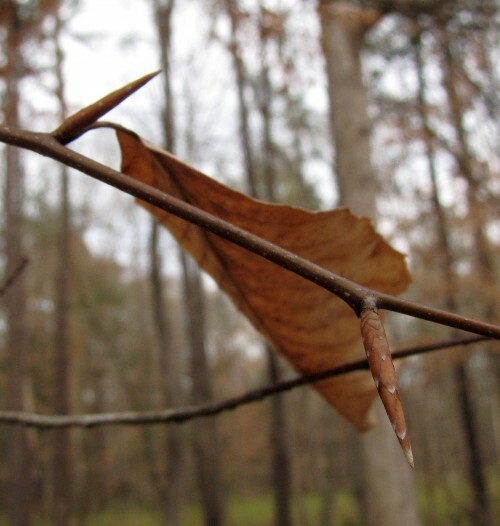 Sweetgum's terminal buds are large, shiny and scaly. 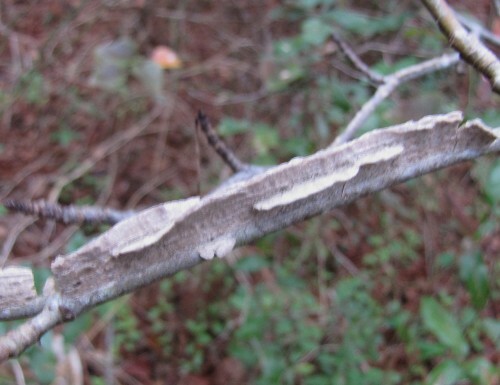 Often some of the twigs will show corky growths of varying sizes and shapes. Bark on young trees can also be covered in warts. 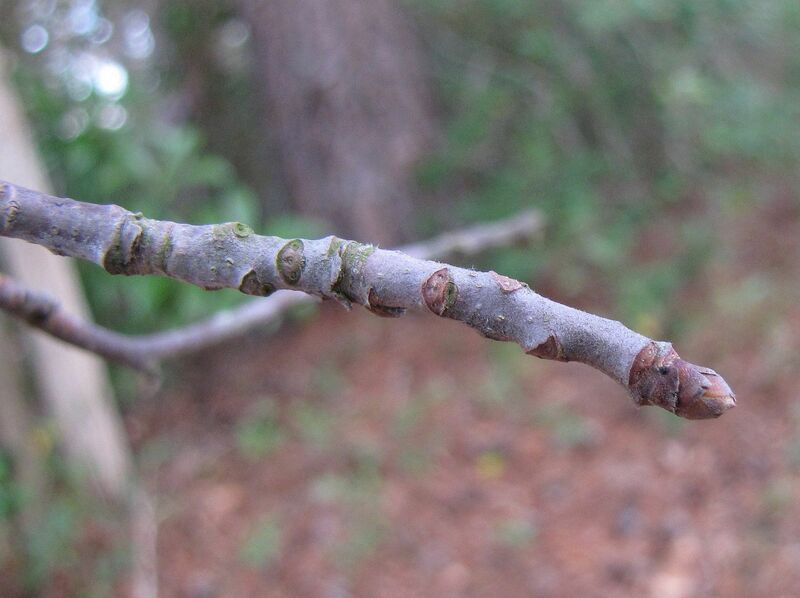 Black walnuts have thick twigs with big U-shaped bud scars and distinctive terminal buds. 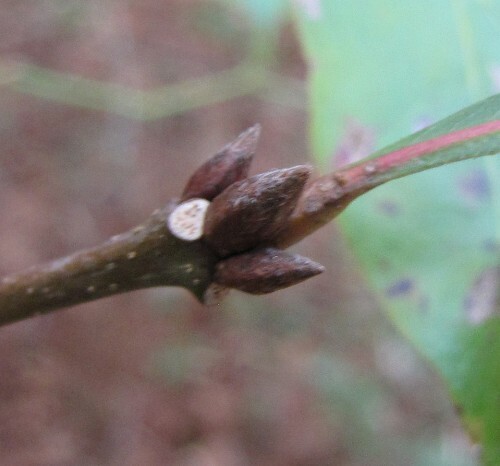 Blackgum has a lot of very short spur twigs. The branches on Blackgums are relatively slender and come out at nearly right angles. Note also the short spurs. 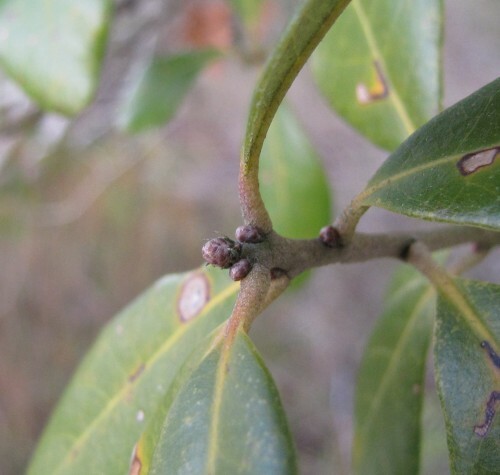 Like all oaks, Laurel Oak has a cluster of terminal buds with overlapping scales. 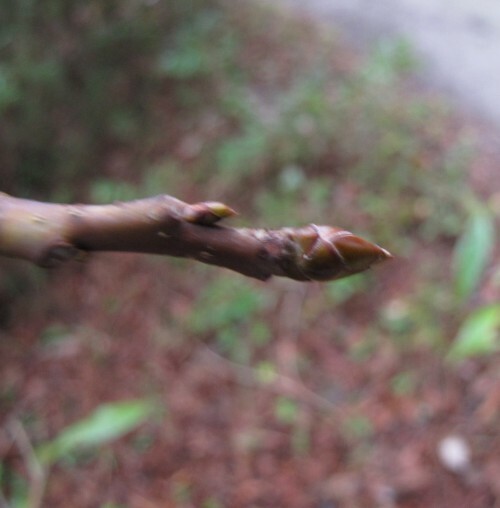 The buds are relatively large for an oak and pointed. 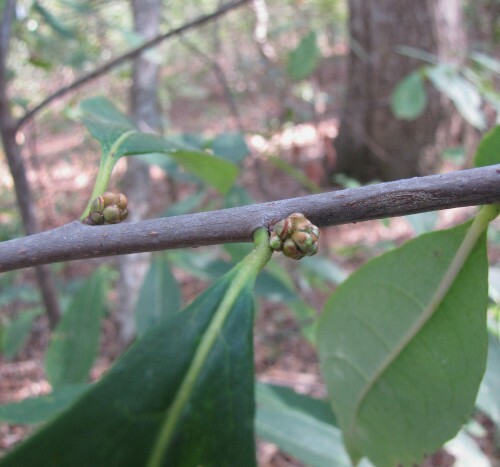 Most oaks in the Red Oak group have these bud characteristics. 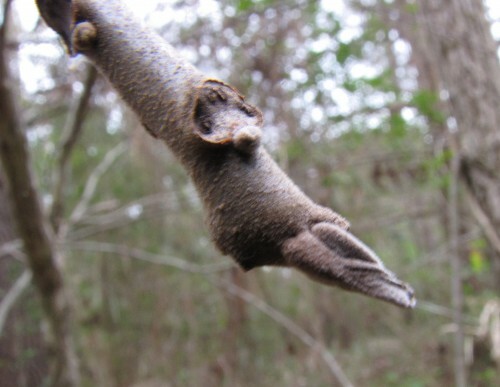 Live Oaks have the usual clustered terminal buds. 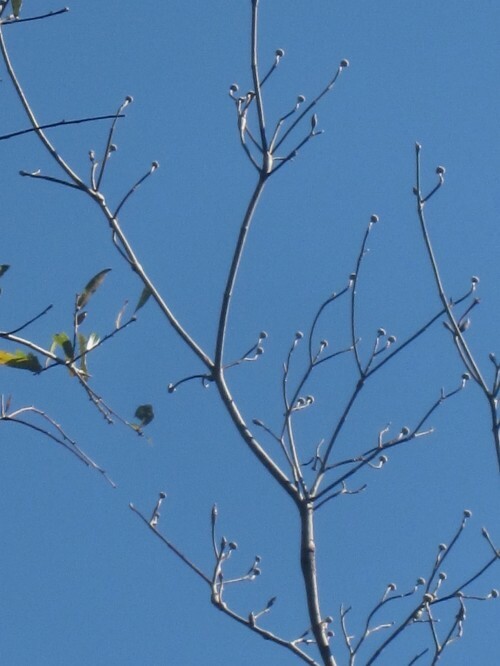 Like most oaks in the White Oak group, they have relatively small, rounded buds. Red Cedar with female "berries"
Red Cedar is dioecious (with male and female flowers on separate plants). 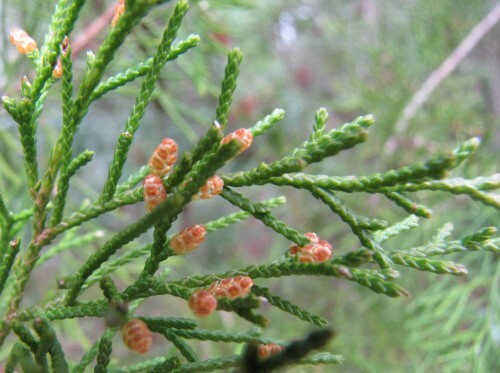 The 'berries" are actually female cones with a fleshy covering. 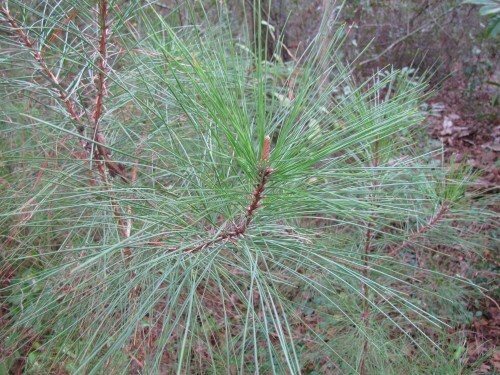 Loblolly Pine, along with Live Oak and Laurel Oak, form the canopy of Coastal Fringe Forest. They have three needles per sheath. There are 4 common evergreen hollies in our area. 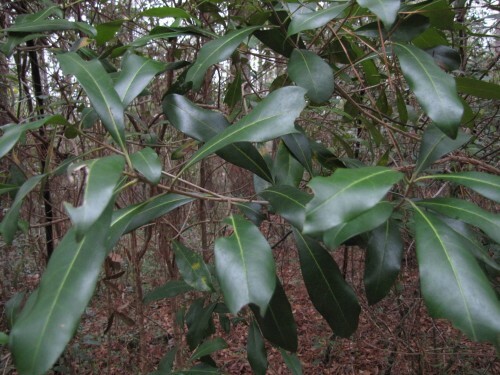 American Holly is the easiest to identify with its spiny leaves. 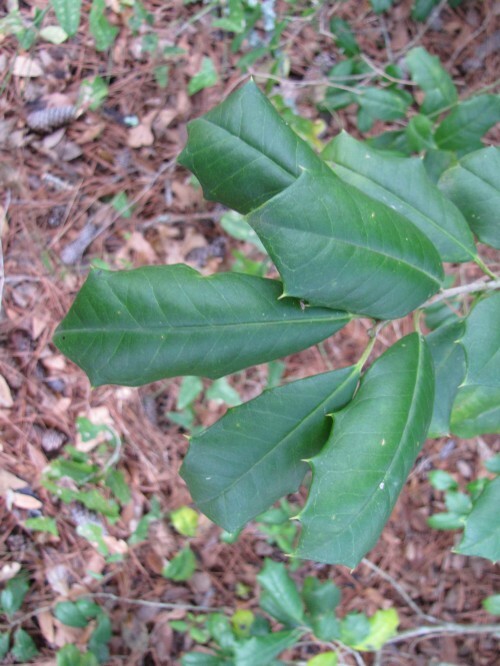 Yaupon has smaller leaves than American Holly and the edges are scalloped (crenate). Inkberry is more difficult to identify. 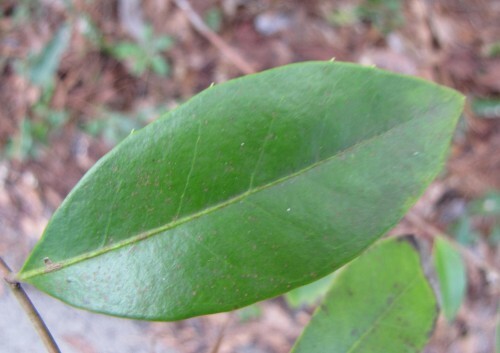 The leaves are small and only the upper half is crenate. The last of the four common evergreen hollies, gallberry, prefers wetter habitat. 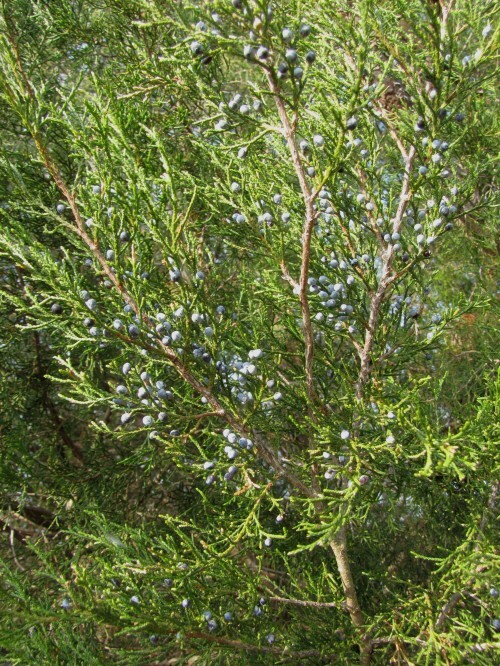 The leaves have small bristles on the edges, irregularly placed. Fat balls of flower buds will open into fuzzy yellow flowers in early spring. The leaves taste "like Granny Smith apples" and the tight, smooth bark has lighter vertical streaks. 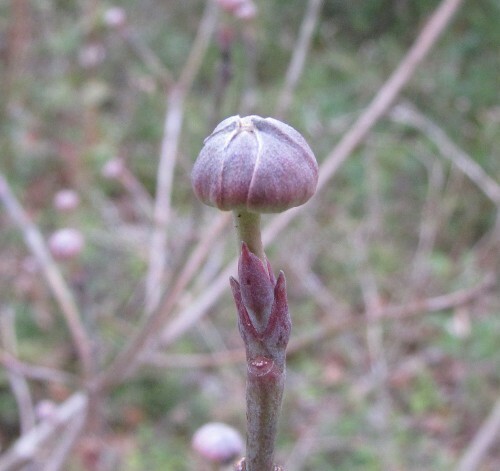 The fat flower buds show up clearly against the sky and are an aid to identification. 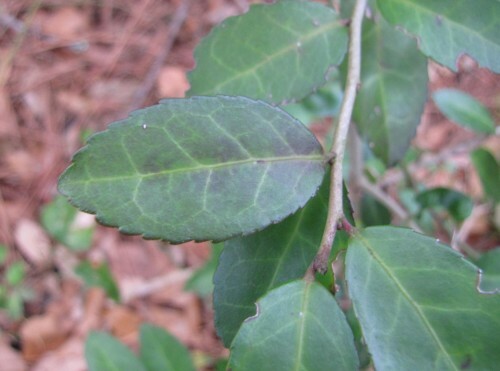 The leaves of Wild Olive are arranged in opposite pairs which makes them easy to distinguish from other evergreen shrubs with similarly shaped leaves. 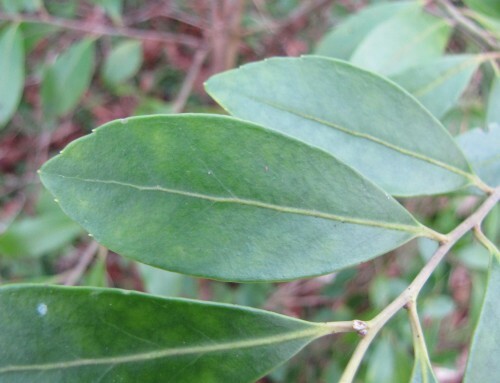 The leaves usually have a soft luster that is distinctive. There are often a few black/blue drupes still hanging on in late winter though they are favorites of robins, hermit thrushes and cedar waxwings. Our best thanks to Charlotte for introducing us to the pleasures of winter identification and for focusing our attention on habitat types as a means to better identify and appreciate our native plants.